Trust us, you’re going to need more than one day in Denver. Our bustling Union Station neighborhood alone will keep you busy with its vibrant array of shops, museums, markets, courtyards and cafes. As a guest of Hotel Indigo Denver, you’re adjacent to historic Union Station and under a mile from Coors Field, the Pepsi Center and the Museum of Contemporary Art. Trains still rumble into this historic beaux-arts station, dating from 1914, including the newly established rail service from Denver International. But locals come for its artisan shops, eateries showcasing rising chefs, and cocktail lounges that make the station a vibrant destination. Home of the Colorado Rockies baseball team since 1995, this classic-styled, 50,000-seat ballpark features hand-laid brick and a vintage-esque clock tower. This popular sports arena, affectionately known as “The Can,” is home to the Denver Nuggets of the NBA, the Colorado Avalanche of the NHL, and the Colorado Mammoth of the NLL. It’s also a popular venue for concerts, family shows, and ice shows. The Denver Broncos have played at this stadium since 2001. The Colorado Sports Hall of Fame Museum is located at Gate #1, on the stadium’s west side. Lawrence Court and UC Denver Buildings, 1250 14th St. 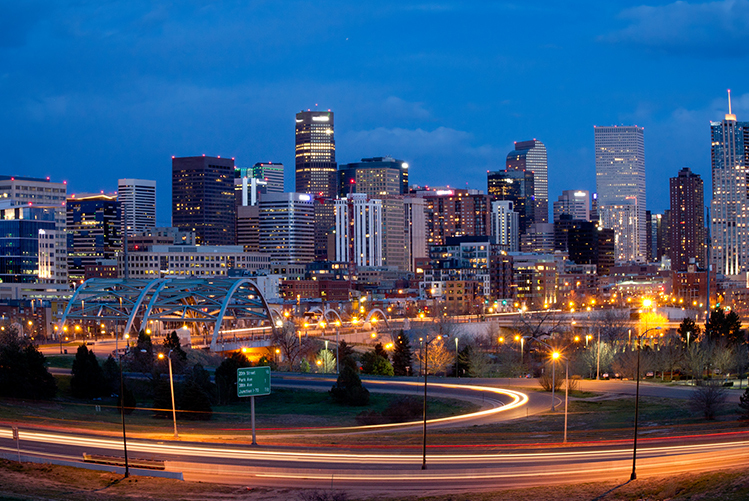 Some 14,000 undergraduates attend the University of Colorado–Denver, founded in 1912 and set on 126 acres in downtown Denver. This conveniently located convention space is in the process of expanding, including new flexible meeting and ballroom space of up to 85,000 square feet; and new pre-function and service space that incorporates an outdoor roof terrace. Treat yourself to a live show at the city’s premier theater venue, where highly acclaimed Broadway shows, Tony-winning plays, and more take the stage. Take a free tour of the white-granite capitol, dating from the 1890s. Along the way you’ll learn that the golden dome gleams from copper panels covered with gold leaf from a Colorado mine and other interesting facts. 100 W. 14th Ave Pkwy. Founded in 1996, Denver’s first repository for contemporary art showcases constantly rotating art installations in five galleries dedicated to innovation and creativity. If you go in with an open mind, you’ll be amply rewarded. Its tranquil rooftop café is a perfect urban escape. Free 45-minute tours take you through one of the nation’s four mints, where coins have been produced since 1906. It’s the world’s single largest producer of coins. Dating from 1896 with the donation of a single black bear, this 80-acre zoo was the country’s first to use natural, free-roaming enclosures for animals rather than barred cages. It’s also been very successful in captive breeding, including maned wolf, California sea lion, red panda, and Bornean orangutan. City Park, 2001 Colorado Blvd. Everything from Egyptian mummies to dinosaur remains occupy this fantastic natural history museum established in 1900.